← The Regional Perinatal Centers of New York – Neonatal Care and primary prevention of postpartum depression at its finest! Remember Jammies for Babies by Hélène Laurè? 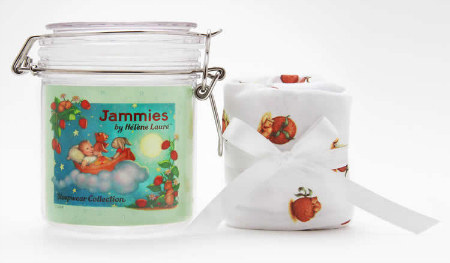 The adorable onesies for a cause so perfectly packaged in a sweet little jam jar? That help fight postpartum depression by donating 10 percent of each sale to Postpartum Progress?Well now the offer is even sweeter with FREE SHIPPING on all orders received through May 15th! As the first product to directly associate its inception and purpose with the fight against these devastating disorders, Jammies for Babies by Hélène Laurè deserves our heartiest support! I know two moms (one a new mother due any day, and the other a repeat mom who just gave birth to a baby girl) who will be receiving Jammies in the next week! And yes, their little babies will be starting their lives by helping others!! Feel free to repost and help Jammies help other moms! And Happy Mother’s Day to all the very special ladies who have enriched our lives!